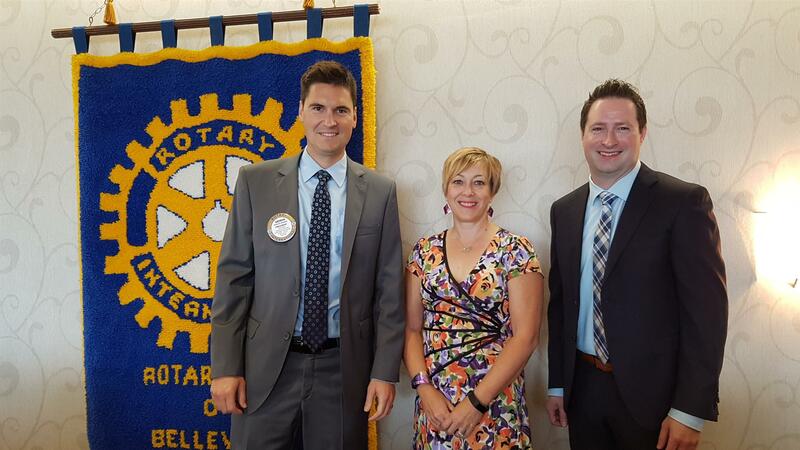 Rob Clute, Executive Director and Cathy Ireland, REVUP Program Manager of QuinteVation were welcomed at Rotary to speak about QuinteVation, a vision of Chair of the Board, Ryan Williams in March 2016. QuinteVation exists to facilitate and encourage business innovation by entrepreneurs and accelerate the growth of industries/sectors in the Bay of Quinte Region, making it the most dynamic rural innovation region in Canada by 2023. The entrepreneurs of the organization believe nobody knows the struggles and drive of entrepreneurs like entrepreneurs. Based on a Rural Ontario Demographic Census done in 2016, rural and small town Ontario population declined by 30% and QuinteVation is analyzing those trends to determine the reasons behind the decline and to work towards reversing those trends through economic development. QuinteVation's focus is on entrepreneurs, working directly with those who are already here and growing their businesses, to help them expand their business in order to create new and skilled labour positions. QuinteVation takes a two pronged approach to economic development. First is Community Building that involves marketing our rural innovative region, establishing industry clusters and entrepreneurial networks, establishing and building community engagement, retaining and attracting talent and hosting the first Canadian Rural Summit November 19th and 20th, 2018 in Belleville. The second prong is Program Delivery to identify and accelerate growth-stage companies, provide mentorship and training, technology transfer and commercialization and networking. QuinteVation works to identify industry clusters that are developing in the region. They were successful in creating the first association of breweries and cideries in Ontario with the Quinte Craft Association, currently with 234 members. New clusters are being developed in film and news media, agri-tech, info-tech and enviro-tech. Cathy Ireland spoke about the RevUp Program, a program focused to accelerate growth-stages. Growth stage companies have unique challenges in building repeatable/scalable models, evolving business or operational processes, managing and raising capital and hiring/grooming leadership teams to increase capacity. The RevUp Program provides a custom built action plan over 6 months, a team of executives in residence, coaching for the founder and leadership team, a contracted "doer" to execute on action priorities and peer-to-peer roundtables/meet-ups. They are looking for companies with strong innovative and/or technological base, ideally product based with a commitment to high growth, annual revenue of $500K or more, a leadership team in place and headquarters in Eastern Ontario. There are partnership opportunities available, not just limited to sponsoring for Canada's 1st Rural Innovation Summit, but to introduce the RevUp Program to growth stage companies who would benefit from the program and to identify individuals with skills and experience for employment opportunities as well as identifying local entrepreneurs and subject matter experts to support the RevUp Program. Rob and Cathy were thanked by Rotarian Bob Clute who emphasized the importance of having the generations that follow us to stay in the area and raise their families here. When we attract entrepreneurs, we can sustain growth.